Guess what? 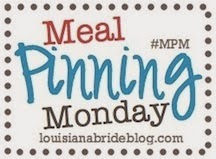 It is Monday, which can only mean one thing, it is the first post for Meal Pinning Mondays! Yay. Yes I know I am posting this a little late in the day, but I was dead tired last night. This week I am pinning both what I am cooking this week from my meal planning, and also what we had on Valentine's Day (we celebrated Saturday). We also had two of the best ribeyes I have ever eaten that we purchased at the meat market across the street, and fried onion straws. I went crazy unhealthy for VDay, and Jeremy enjoyed it big time. That baked brie dip is TO DIE FOR! I had to healthy this one up as much as I could, so I found some fat free heavy cream. After the amount of cheese we are consuming from the chowder I decided to leave it off of the cabbage. We are in dairy fat overload this week! Okay, now it's your turn! Show some love and link up:) The html code for the MPM button is on the right sidebar.